Don’t miss your chance to join us! 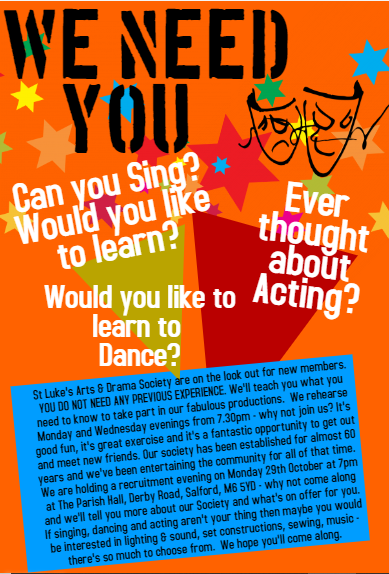 St Luke’s Arts & Drama Society are on the look out for new members. We will teach you what you need to know to take part in our fabulous productions. We rehearse Monday and Wednesday evenings from 7.30pm – why not join us? It’s good fun, it’s great exercise and it’s a fantastic opportunity to get out and meet new friends. Our society has been established for almost 60 years and we’ve been entertaining the community for all of that time. We are holding a recruitment evening on Monday 29th October at 7pm at the Parish Hall, Derby Road, Salford M6 5YD – why not come along and we’ll tell you more about our society and what’s on offer for you. If singing, dancing and acting aren’t your thing then maybe you would be interested in lighting & sound, set construction, sewing, music – there is so much to choose from! We hope you’ll come along.